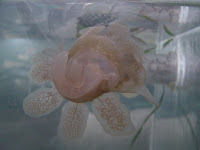 I'm happy to report that Spring has sprung in our Marine Exhibit (though unhappy in my personal life due to hay fever)! -The hooded nudibranchs have been spending a lot of quality time together, resulting in at least three egg cases in the eel grass tank. Perhaps more to come soon! -The green urchins have been spawning quite a bit. When Liza or I would start to siphon in the tank, they would start to go! -A couple mottled sea stars were also spotted spawning. -Sticklebacks made a little nest with some eggs in the eel grass tank. 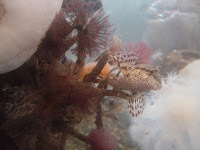 -The painted greenling laid eggs in the piling tank on a cluster of tube worms. Unfortunately, for the greenling and its offspring, the effort was in vain. Very soon after, the opportunistic Pollock (I’m assuming it was them) had a tasty snack. Hope to see many of you this Wednesday, 6pm, for the marine bio study group meeting all about plankton! We will be in the marine exhibit classroom." Thank you for keeping us updated Brenda!